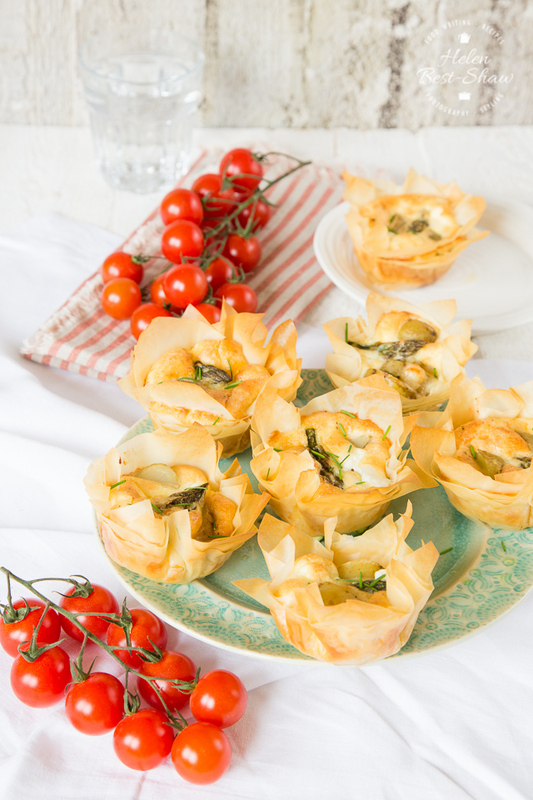 These individual vegetarian filo tarts are filled with new season potatoes, asparagus & goats cheese. Perfect for picnics. Jersey Royal new potatoes are one of the jewels of the late spring and early summer, and are something that I greatly look forward to every year. These small potatoes are delicately, but fully flavoured with a rich potato nuttiness and are encased in a paper-thin skin. The Jersey Royal potato fields are fertilised with seaweed, known on the island as Vraic, which is washed up on the beach with every tide. Because of the unique way they are grown and cultivated, Jersey Royals have been granted an EU Protected Designation of Origin (PDO), the only fresh fruit or vegetable in the United Kingdom to have this designation. Jersey Royals are only available in Jersey and the mainland Britain, and if you are a visitor between April and July they are well worth seeking out. During the season they are harvested and exported every day, so you can be assured that the Jersey Royals on the supermarket shelves will be fresh and in good condition. Jersey Royals are delicious boiled or steamed in their skins and served warm with lots of butter, pepper and salt and some fresh chives or mint, and are often the centre piece of the ubiquitous potato salad. 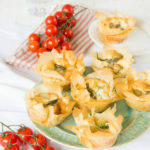 They are a fantastic ingredient so I used Jersey Royals from Tesco in these individual filo tartlets, paired with seasonal asparagus. 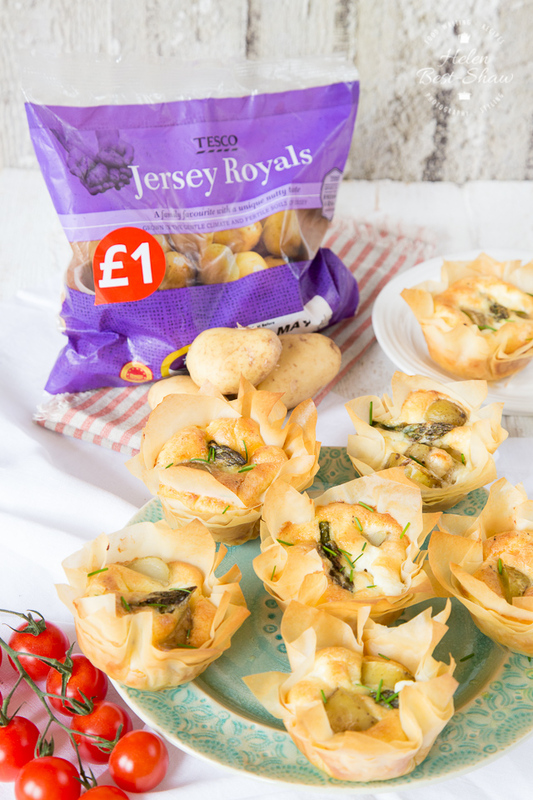 A bag of Tesco Jersey Royals costs just £1, which makes them a very affordable premium ingredient, perfect for an everyday treat. 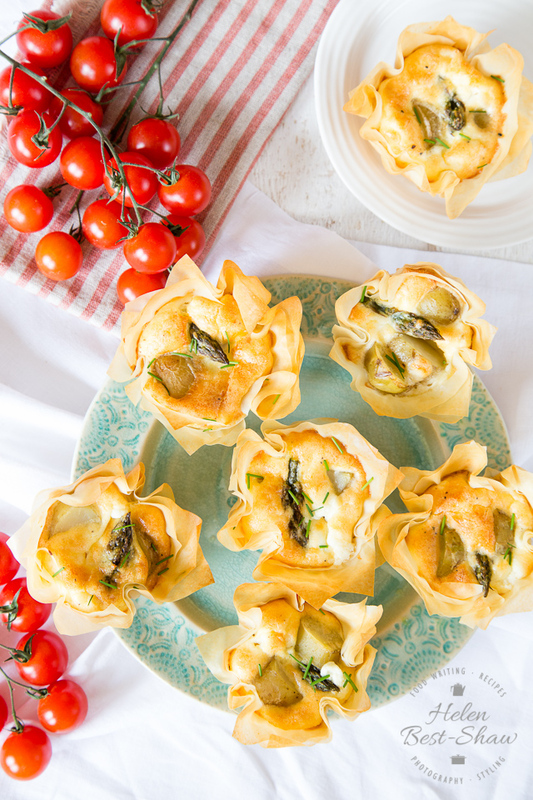 If you try this Jersey Royal (New Potato), Asparagus & Goats Cheese Filo Tartlets please tag #FussFreeFlavours on Instagram or Twitter. It is amazing for me when for me when you make one of my recipes and I really do love to see them. You can also share it on my Facebook page. Please pin this recipe to Pinterest too! Thanks for reading Fuss Free Flavours! Cut the Jersey Royal potatoes into 1cm thick slices, and add to a saucepan of salted boiling water; simmer at a gentle boil for 10 minutes. Drain the potatoes. Cut the tips off the asparagus spears and fry together with the potatoes in 2tsp of the oil for 3-4 minutes. Add the cream to a jug, break in the eggs and add half the goats’ cheese; season with salt and pepper and whisk together. Cut the other half of the goats’ cheese into 12 small cubes. Lay out the filo pastry, and cut all four layers at the same time into 12 sets of squares large enough for your cupcake tin. Take each stack of filo, and brush each layer with oil. Overlap them at different angles as you reform the layers. Push each set of filo squares down into the cupcake tray. While preparing each tart, keep the remaining filo pastry under a damp tea-towel to stop it drying out. Place 2-3 pieces of potato and a cube of goats cheese in each case. Fill each one 2/3 full with the cream, egg and cheese mixture – the mixture will expand. Float an asparagus tip on top. Bake for 20-25 minutes until the egg and cream mixture is golden. Eat warm or cold the same day. Store for up to two days in a container in the fridge. Reheat in a low oven until the pastry is crisp again. Wrap leftover filo in clingfilm and freeze. Use the asparagus stalks in a risotto, or shave for a salad.